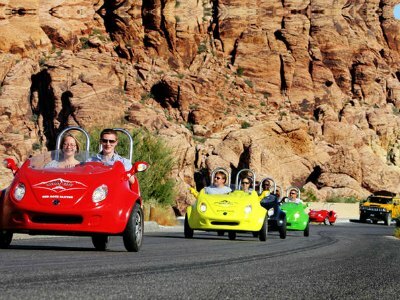 Red Rock Canyon tours from Las Vegas are fun, exciting and very popular. There are many ways to visit this hidden gem - from most popular mini-van tour to mini three-wheel-scooters, helicopters, and jeep tours. 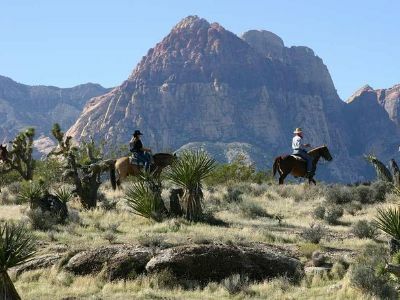 Once at the Red Rock Canyon, you can do horseback riding, hiking, riding mountain bikes or road bikes. How about discovering the natural beauty of Red Rock Canyon on a scooter? Nothing is impossible in Vegas! 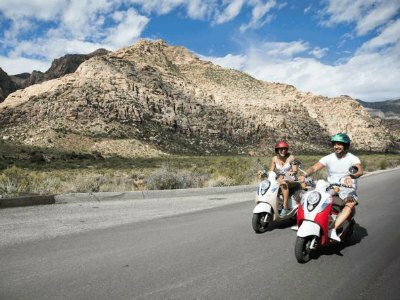 Join this unique scooter tour of Red Rock Canyon tour and visit this stunning area. It is filled with wildlife, fabulous rock formations and awe-inspiring scenery. Your guide will teach about the area, the history and geology as you follow him on a scooter. The drive is easy and an orientation lesson will be provided before you set off. When you stop, climb the rocks and get some selfies! This tour makes a great outdoor bonding experience for the whole family. 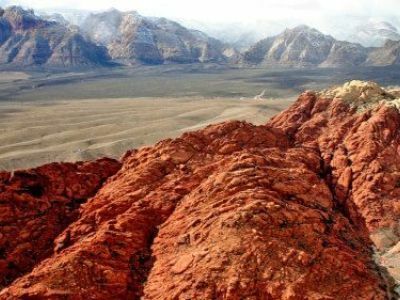 With these popular Red Rock Canyon tours from Las Vegas you'll have two options- 4 hours and 6 hours tour. The 4 hour express tour includes van transportation from the hotel to the Red Rock Canyon where your guide will tell you about the unique wildlife, geography and past explorers of the area. It also includes a ride to the scenic loop. The 6 hour tour is more comprehensive and includes the scenic loop. Along the route, stop at the Calico Hills, the Willow Springs petroglyphs and the Indian roasting pits. Lunch is included in the tour. You'll also be able to visit the Spring Mountain State Park, once owned by Howard Hughes. Red Rock Canyon tours by horseback begin with a visit to a working ranch. Enjoy a western breakfast/lunch or dinner on arrival while enjoying the majestic mountains around you. Ride a tame and friendly horse, suitable for all levels of experience. You'll ride for about an hour on trails that were once used by Western outlaws. Enjoy beautiful views of horses and cattle grazing around. You might even spot jack rabbits, road runners and big horn sheep. After the Red Rock Canyon horseback ride, you'll visit the petting zoo and cowboy town before heading back to your hotel. So you what to go Jeepin’? 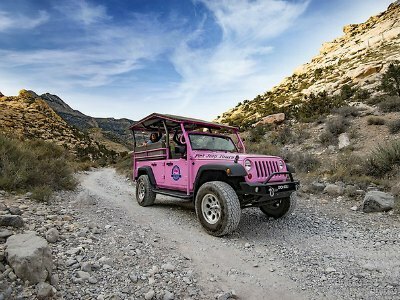 Then these Red Rock canyon tours from Vegas are perfect for you as you enter a pink Jeep and enjoy an interesting narrated and guided tour that takes you through Red Rock Canyon to an area that is only accessible to off-road vehicles. You will want to wear layered clothing as you adventure during this possible 6-hour tour that includes numerous chances to shot photographs of such remarkable places like Calico Hills, Red Rock Canyon Visitor’s Center, Willow Springs to name a few. Feel like a trail blazer as you travel along a pioneer trail through Rocky Gap Road which is only accessible by off-road vehicles. The adventure will take you by the Native American artifacts, an ancient thrust fault and fossilized sand dunes. You might also choose to upgrade and include a horseback riding excursion with lunch at the Spring Mountain Range. This upgrade has weight restrictions of no more than 250 pounds and you must be at least six years of age. 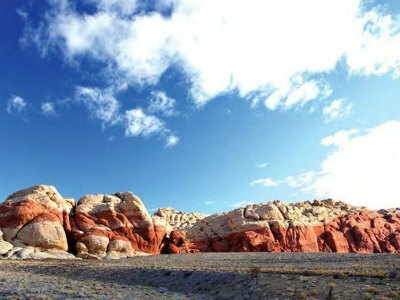 These are fully-narrated Red Rock Canyon tours from Vegas with a choice of two departure times. The groups are quite small to allow personal service. Free pick-up and drop services included. The tour begins with a 13 mile long scenic drive where you will be able to view the beautiful Wilson Cliffs and spectacular scenery. You'll be able to view the Calico Hills with their colorful sand dunes and many other geological features. Stop by at the visitor center to check out the gift shop, the desert tortoise habitat and many other interesting exhibits. This tour also includes an off-road ride up the Rock Gap road. This is a 3.5 hour long Red Rock Canyon tour that will allow you to explore the beautiful conservation area in a unique and exciting way. You will be provided a scooter car and safety overview that you'll be able to drive through the beautiful Mojave Desert on your way to Red Rock Canyon. You'll learn more about the wildlife, Paiute Indians and the flora of this area at the visitor center before heading out on a 21 km scenic loop. Enjoy beautiful views along the way; explore the area on your own on the scooters and on foot before heading back to the hotel. 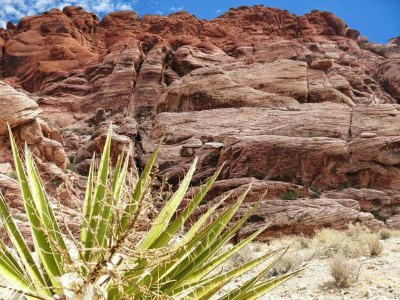 These hiking Red Rock Canyon tours tour will allow you to escape Las Vegas and hike with a local guide to one of the popular trails in the park. Choose from Ice Box Canyon, White Rock to Willow Springs or Calico Hills. Calico Hills trail includes a 4 km, relatively easy hike from the Calico Basin up to the Sandstone Quarry. Another option is to start at White Rock where you'll hike about 7.8 Km through a ridge, guzzler and to the Los Creek area. The Ice Box Canyon hike is slightly more strenuous since it involves walking around boulders, climbing up the side of a canyon and scrambling up a tricky wall to visit the upper pool. The Red Rock Canyon hiking tour includes a professional guide, transportation to and from the hotel by an air-conditioned coach and bottled water. With these guided or self guided Red Rock Canyon tours along the Scenic Loop you have a choice between a Cannondale road bike or a Gary Fisher hybrid bike. The tour includes all the equipment you may need. Please note that this is not a casual and easy tour - during the first 5 - 6 miles be prepared to climb about 1000 feet uphill, after which it becomes easy and enjoyable. While the self-guided option sounds may sound like more fun to experienced bikers, remember that a guide will show you the places you won't be able to spot on your own! Enjoy the beauty of the Red Rock Canyon with a mountain bike tour. Tour cost includes transportation from the Vegas Strip. Choose from the Elsworth Epiphany or Santa Cruz Superlite mountain bike and ride with a professional guide to explore the sights with full narration. The tour includes bike rental, water and helmet. Ride through the Mustang Trail that is ideal for beginners as well as experienced riders. The trail includes a climb as well as descent and offers a quick pace. The total distance covered Red Rock Canyon tours by mountain bike is up to 12 miles. This is a great way to experience the Red Rock Canyon and its rugged beauty. 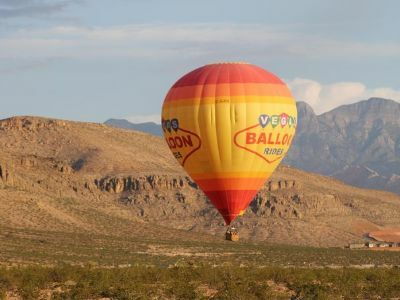 The Hot Air Balloon Ride Tour is one of the more unique romantic ideas for couples who want to have a bird’s eye view of the gorgeous natural landscapes as well as the Strip. Your 3.5-hour flying excursion has many different starting times throughout the day including a remarkable sunset flight. Your adventure begins with hotel pick-up service where you will be transported to your state-of-the-art hot air balloon. After a quick safety meeting you will embark your hot air balloon as you start Walking with the Winds for 1-hour under the clouds. While you are in the air you will be amazed at the beautiful scenery that ranges from Red Rock Canyon National Conservation Area to the Mojave Desert to Mt. Charleston rising in the background. On your return flight you will get a bird’s eye view of all the important landmarks on the Strip like the Eiffel Tower, Stratosphere Tower and the High Roller. For an added romantic theme try the sunset Las Vegas and Red Rock Canyon Tour where the neon lights of Sin City begin to glow while the sky turns into a canvas of pastel colors. Once you land you can celebrate with light snacks and a champagne toast before you are transported back to your hotel. One of the best ways for visitors to get out of Sin City for the day and experience breathtaking scenery is to take the 2-Hour Horseback Riding Tour through Red Rock Canyon. 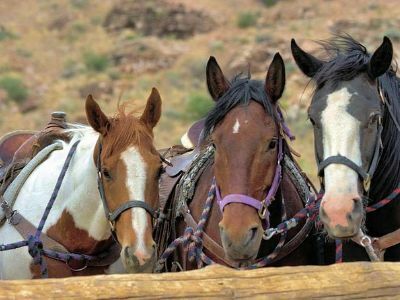 Your 5-hour riding adventure is perfect for all horseback riders from beginner to expert and starts with complimentary hotel pick-up service where you will transported to Red Rock Canyon Stables. Once here, expert trail hands will outfit you with all the necessary riding equipment and choose a horse that fits your riding ability. After a few quick lessons on riding techniques, you set-out on the trail that has you winding through the beautiful landscape of Red Rock Canyon National Conservation Area. While you are on your 2-hour ride, an expert trail guide will tell you interesting stories about the canyon and explain all the wildlife you encounter. The scenery in the canyon is second-to-none in the area with plenty of colorful rock formations and gorges that tell stories all on their own. Your exciting trail ride concludes with drop-off service back at your hotel. 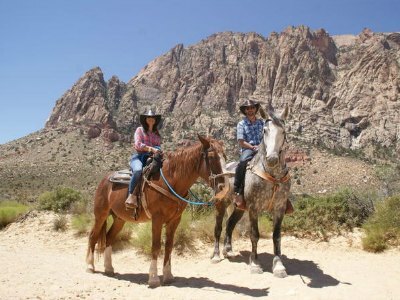 An adventurous Red Rock Canyon tour for all types of people from couples to families to friends is the Red Rock Canyon Sunset Horseback Ride and Barbeque . Your 5-hour journey begins with complimentary hotel pick-up service from select hotels where you will be transported to the Red Rock Canyon Stables. Here you will meet your trail guide who will outfit with all the necessary riding equipment and pair you with a horse depending on your riding abilities. Once in the saddle your expert guide will take you on a stellar 90-minute horseback ride through the brilliantly colored rock formations that change instantly from orange to red to pink. Along the way your guide will point interesting things as well as explain the wildlife that lives in the area. When you reach a high mountain plain you will gaze out over the canyon with an incredible view of Las Vegas in the backdrop. After you dismount you will gather around a campfire and watch the sky melt into a canvas of pastel colors while your cowboy chef prepares an outstanding three-course barbeque meal that includes all the fixings. While you eat there is plenty of live entertainment from storytelling to poetry to sing-alongs. Your journey concludes with drop-off service at selected hotels along the Strip. 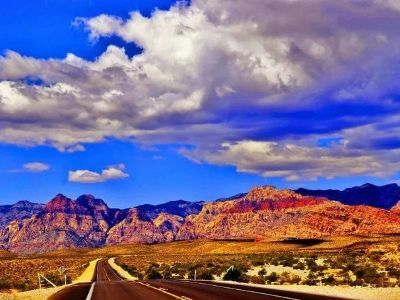 A relaxing and entertaining Red Rock Canyon tour for people who want to view some of the most interesting natural landscapes within minutes of Sin City is the Segway Tour from Las Vegas. Your 4-hour journey begins when you picked-up at your hotel and taken to the 200,000-acre Red Rock Canyon National Conservation Area. Here you will meet your expert guide, be outfitted with all the necessary equipment and take a quick training session on how to maneuver your Segway. 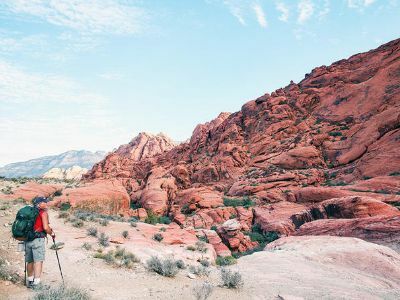 Afterwards you will set-out on a 13-mile paved loop trail through Red Rock Canyon on your Segway while your guide fills you in on all the intriguing rock formations you are viewing. While in the national conservation area you have plenty of wildlife viewing opportunities too with over 200 species of animals to see roaming through the brightly colored sandstone which changes from red to pink to orange to purple. As you near of the end of your journey you will stop for a few snacks and refreshments at Willow Springs where you can also finish taking numerous photographs of this fantastic natural landscape. Your excursion concludes with drop-off service back at your hotel. If you like exploring incredible natural landscapes at your own pace with a little bit of exercise thrown in then you should try the Electric Bike Red Rock Canyon tour. Your 3-hour peddling journey starts with free pick-up service from your hotel where you will be driven to a bike shop in the Summerlin neighborhood. 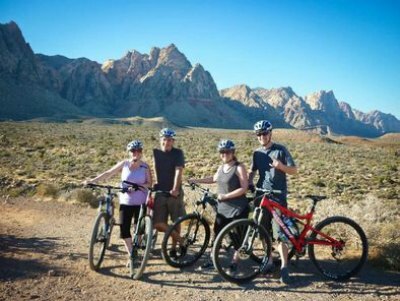 After you are outfitted with all the necessary equipment from your electric bike to helmet you will set-out on a 4-mile peddle to Red Rock Canyon National Conservation Area. Your adventure is made easier with a state-of-the-art electric bike which assists you in peddling when you encounter headwinds and inclines as well as allowing you to go 20mph on level ground. Once at the national conservation area you will embark on a paved 13-mile scenic byway that has you traveling through the area that is loaded with fantastic rock formations carved by nature as well as over 200 species of native wildlife. When you reach the highest elevation of your self-guided journey at 4,800-feet you can admire the brilliantly colored landscape of orange, red, pink and purple sandstones. After completing the loop byway you start your back to the bike where you will then be transported back to your hotel. A great intimate way to see some of the most interesting landscapes of Nevada and an incredible view of Sin City is to try the Las Vegas Strip and Red Rock Canyon Tour by helicopter. There are numerous departure times for this 3-hour adventure which starts when you meet your pilot at the North Las Vegas Airport where you will board a customized three passenger helicopter for your 1-hour flight of sightseeing. As you soar to Red Rock Canyon National Conservation Area your expert pilot will explain all the intriguing landscape you will view. Once at the 200,000-acre national conservation area your eyes will pop from the brilliantly colored sandstones that range from purple to pink to orange to red. As your pilot turns back toward Sin City you will soar above the Strip while experiencing a bird’s eye view of standout attractions such as the Bellagio Fountains, the Eiffel Tower, the Luxor Pyramids and the Stratosphere needle in the sky. Your exciting excursion concludes when you touch down at the airport. 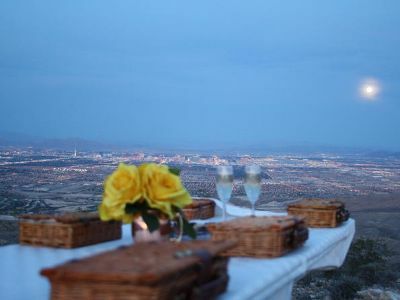 A romantic adventure that includes stellar landscapes and a bird’s eye view of the Strip as well as an intimate picnic is the Red Rock Canyon Helicopter Tour and Twilight Picnic. Your 2.5-hour romantic time begins with complimentary limousine pick-up service from your hotel where you will be transported to the North Las Vegas Airport. Here you will board a state-of-the-art sightseeing helicopter and meet your expert pilot who will explain all the interesting landscapes you will see on your 30-minute flying adventure. Once in the air you will soar to Red Rock Canyon National Conservation Area while taking in views of nearby Potosi Mountain and Mt. Charleston. While you fly over the national conservation area you will be thrilled with a bird’s eye view of the brilliantly colored sandstone that has been carved by nature into a variety of intriguing formations. Your pilot will touchdown at a secluded spot within Red Rock Canyon where you will partake in a delightful picnic complete with champagne. Back in the air you head to the Strip where you will fly over all the famous landmarks such as the Eiffel Tower, the Stratosphere Tower, Bellagio Fountains and view the neon as Sin City comes to life in the evening. Your romantic Red Rock Canyon Tour concludes with limousine drop-off service back at your hotel.